After her father was diagnosed with Parkinson’s about three years ago, social worker Julie Plumley set up a local community club to create a place where retired men with a history of farming – but who now have life-changing conditions – can meet other like-minded peers. Julie realised there was nothing that catered to older, retired men who, like her father, had previously enjoyed an outdoor life. 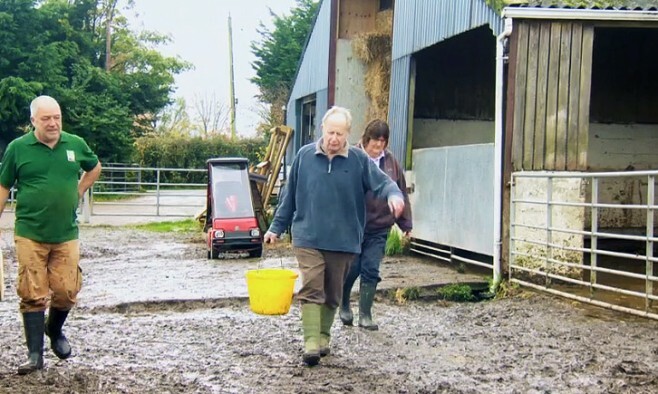 The Countrymen’s Club based at Rylands Farm in Dorset, UK, meets up twice a week and organises farming activities out on the land for its members whose ages range from 60 to 100. The meetings ensure a lifetime of outdoor traditions and skills aren’t forgotten – and the old times are remembered. And, it’s having a positive effective on the physical and mental wellbeing of its members. Speaking on ‘Countryfile’ (a British TV programme about rural life), Julie who grew up on a farm, says: “Low serotonin levels are the problem with Parkinson’s. If you bring them out into the sensory environment they love: smelling the cows, the silage, the noises – all of a sudden, the serotonin kicks in. Julie’s 20 years working as a social worker means she recognises the importance of community spirit. The social gatherings on the farm are a great opportunity to get the men outdoors and keep them active. The club also builds a sense of belonging for a group of people who in many cases would otherwise be confined to a life of loneliness. Ruth Eckersall, the daughter of member Tony, says: “For us as a family, it’s been a bit of a life-saver, because if he was at home, he’d be in isolation and in silence. He doesn’t read or watch TV anymore, so this gives him some stimulation. In the future Julie hopes that initiatives like the Countrymen’s Club will be replicated in other parts of the UK. And it’s not just about the men. She is planning to start an equivalent club for elderly rural women called ‘Landladies’.